Asked by reporters at the start of a Cabinet meeting whether Russia is still targeting the U.S., President Trump shook his head and said "no." The White House is denying that President Trump believes Russia is no longer targeting U.S. elections and other infrastructure, despite his apparent answer to a reporter's question Wednesday morning. Asked at the start of a Cabinet meeting whether Russia is still targeting the U.S., Trump shook his head and said "no." Later, White House press secretary Sarah Sanders sought to clarify Trump's comments, saying his "no" meant that he was not taking any questions from reporters. It was the second time this week that Trump's words about Russian interference required clarification and revision by the White House. Less than 24 hours after proclaiming on Tuesday his "full faith and support for America's great intelligence agencies," Trump seemed to contradict those agencies once again during Wednesday morning's Cabinet meeting. 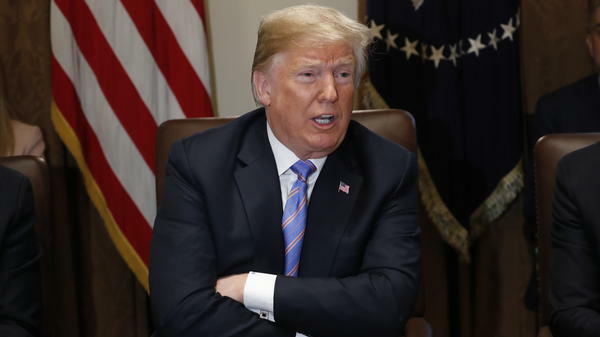 In an interview with CBS News' Jeff Glor airing Wednesday evening, Trump expressed confidence in U.S. intelligence agencies and said he agreed with their assessment. In addition, the president went much further than he had when he was standing right next to Russian President Vladimir Putin earlier this week, telling CBS that Putin was personally responsible for the election interference "because he's in charge of the country." Trump said he had been "very strong on the fact that we can't have meddling, we can't have any of that," when he spoke one-on-one with the Russian leader. But he also shifted blame to his predecessor as he has done repeatedly and reiterated there was no "collusion" between his campaign and Russia and called the whole special counsel investigation a "vicious witch hunt." "We're also living in a grown-up world. Will a strong statement — you know — President Obama supposedly made a strong statement — nobody heard it. What they did hear is a statement he made to Putin's very close friend. And that statement was not acceptable. Didn't get very much play relatively speaking. But that statement was not acceptable," Trump said. "But I let him know we can't have this, we're not going to have it, and that's the way it's going to be." Director of National Intelligence Dan Coats said last week that "the warning signs are there. The system is blinking" and that "today, the digital infrastructure that serves this country is literally under attack." On Wednesday, Republican Sen. Lindsey Graham pointed to "a big discrepancy" between what they believed Trump said Wednesday and Coats' warning. "It's imperative we get to the bottom of what is going on so we can be prepared to protect ourselves in advance of the 2018 elections," Graham said. But later, Graham issued a statement that he was reassured "unequivocally by the White House legislative team that the President's 'no' response.....was not intended to suggest that President Trump doubts the intelligence community's assessment that Russia is continuing to attack our critical infrastructure in the 2018 elections." Other GOP senators pushed back on the idea that Russia is no longer targeting the U.S. Senate intelligence committee Chairman Richard Burr, R-N.C., when asked whether there was any doubt that Russia was still targeting upcoming U.S. elections, responded "none," adding Trump "ought to look at the intelligence." Sen. Marco Rubio, R-Fla., who is co-sponsoring bipartisan legislation meant to ratchet up sanctions on Russia if it interferes in future elections, said Trump's assessment was "not true, it's not accurate." "Obviously he has a very different take on what's occurring," said Rubio, who also sits on the intelligence committee. "I'm not sure we can change his mind about it, but I'll tell you, we can pass a law that does something about it." Trump said before the Cabinet meeting, "There's never been a president as tough on Russia as I have been," citing economic sanctions. Earlier, he tweeted that "so many people at the higher ends of intelligence" loved his press conference in Helsinki and that he got along well with Putin, "which truly bothered many haters who wanted to see a boxing match." At that Helsinki press conference after his meeting with Putin on Monday, Trump was asked whether he had confronted Putin about Russia's interference in the 2016 election. In response, Trump said his "people came to me" and said "they think it's Russia." As Putin looked on beside him, Trump said, "I have President Putin; he just said it's not Russia. I will say this: I don't see any reason why it would be." On Tuesday, Trump read from a printed statement, and said he had misspoken in Helsinki. "The sentence should have been, 'I don't see any reason why it wouldn't be Russia,' sort of a double negative," Trump said. "So you can put that in, and I think that probably clarifies things pretty good."